The mention of the name of Yuri Soloviev arouses great excitement from those who were fortunate enough to see him on stage. Yuri Vladimirovich Soloviev was born in Leningrad on August 10, 1940. He entered the Vaganova Choreographic School in his hometown in 1949. His talent was recognised very early on at the school. His highly personal lyrical qualities and his amazing facility in steps of elevation were nurtured and perfected for the last four years of study under the sole guidance of Boris Shavrov (who had danced with Spessivtseva). Soloviev made his debut at the Kirov in the pas de trois from Swan Lake (with Alla Sizova and Natalia Makarova) at a pregraduate performance. 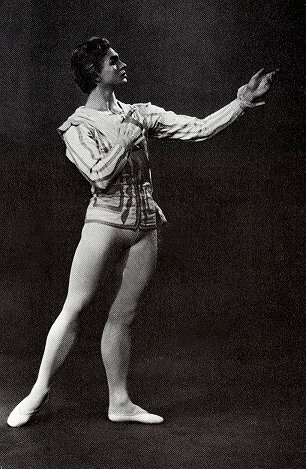 Following his performance of the Bluebird pas de deux from The Sleeping Beauty at his graduation in 1958, which caused a sensation and would remain of one his finest achievements, he was immediately accepted into the Kirov Theatre. 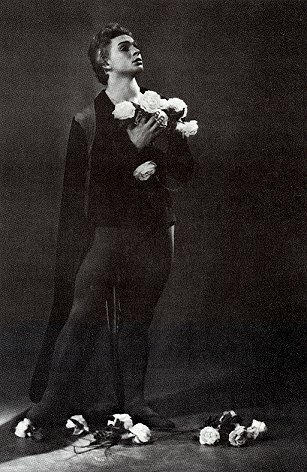 Early on Soloviev was only cast in small classical roles in Laurentia, Raymonda (as troubadour), and in the Peasant pas de deux in Giselle. But soon he was making considerable strides ahead and was entrusted with the lead in Chopiniana and for the 1961 Western European tour he danced Désiré in Sleeping Beauty, Albrecht in Giselle and Siegfried in Swan Lake. He had great success in all of them. Another of his most popular roles during that first tour was Danila in The Stone Flower in which he and Alla Sizova enjoyed a significant personal triumph at Covent Garden. The ballet was such a success that the BBC recorded and televised Act 1 with them both and Alla Ossipenko. His long-term partnership with Sizova was arguably the artistic high point of both their careers. They also created the leading roles in the premiere of Igor Belsky's Leningrad Symphony in April 1961. A role not seen by western audiences was Ferkhad in The Legend of Love, one of a gallery of contemporary roles. 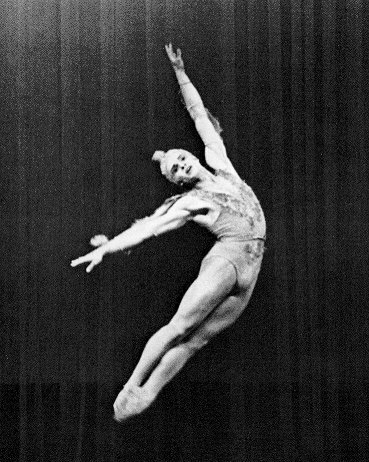 Soloviev also became a great favourite with audiences in several divertissements, notably the pas de deux from Le Corsaire, dancing most successfully with Alla Sizova but also with Kaleria Fedicheva and Natalia Makarova. Other noteworthy performances include the pas de deux from Flower Festival in Genzano with Alla Sizova and Grand Pas Classique by Gsovsky in which he partnered Gabriella Komleva. He also danced regularly in many full-length roles with Irina Kolpakova, most notably in The Sleeping Beauty and Romeo and Juliet. Yuri Soloviev's mastery is genuinely unique. He had perhaps the most remarkable elevation of any dancer of his generation, but more than the sheer height of these flights, they were combined with a softness, clarity, and ballon seemingly defying gravity, which led to the nickname of 'Cosmonautic Yuri' among his colleagues in the Kirov Ballet. There seemed to be no technical difficulty he was unable to master completely. Soloviev was a sensitive and gifted actor, a master of understatement and taste. His dance facility attracted many choreographers in the Soviet Union and he created many roles in contemporary Soviet ballets by Sergeyev, Jacobson, Belsky, Alexidze and the Moscow couple Kasatkina and Vasiliov. Fortunately his dancing is well preserved on film. 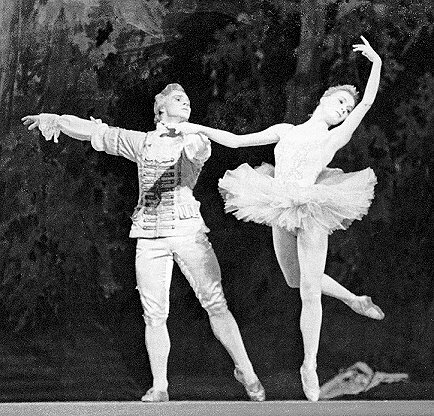 There are many archive films of his work in Russia but to most people he will be familiar in the film of The Sleeping Beauty with Alla Sizova, which provides an excellent record of his dance accomplishments, the delicacy of his manner, and a wonderful souvenir of a great ballet partnership. He was an intensely private and reserved individual. He died on 12 January 1977 at his dacha just outside Leningrad. It appears to have been suicide. He was married to Tatiana Legat, a former soloist of the Kirov Ballet. 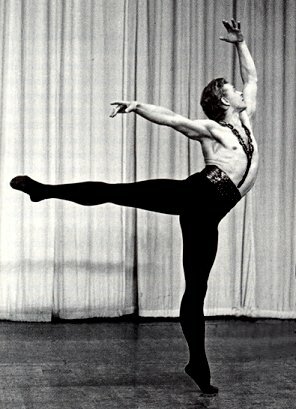 In 1963 he was awarded the Nijinsky Prize by the Paris Academy of Dance. He was a Gold Medal winner at the Paris International Dance Competition in 1965, and was made a People's Artist of the USSR in 1973. Text of Yuri Soloviev Copyright © 2002 Geoff Whitlock. All rights reserved.